Cabinet Color Samples approx 3" long made from mouldings in the same wood and finish. 6 Pieces. By Priority Mail. 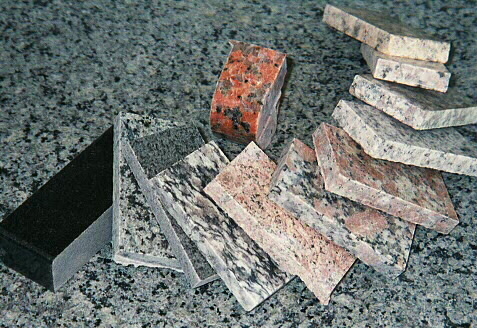 Vanity top Granite Color Samples approx 1.5" x 3" long. 13 Colors. By Priority Mail. 7" Deluxe Diamond Blade. Click on Photo for more info. 4.5" Deluxe Diamond Blade. Click on Photo for more info. This special tool is discounted $40 with granite slab orders. Allows you to cut the 45 degree cuts straight and easily for inside corners. Made in USA. This special tool is discounted $70 with granite slab orders. We also offer a 30% discount on 10 or more. Our own secret recipe. Will allow you to sand and polish seaming material without scratching granite. Universal Water Attachment with valve and velcro and 7" Deluxe Diamond Blade. Click on Photo for more info. 750 ml of Italian Granite Wax. This gives your granite and other polished stone surfaces a beautiful lustre and added protection. It goes on like car wax but is then buffed (and excess removed) with steel wool. You won't find this professional product at the big warehouse stores. Choose Black color for Black or very dark colors. Choose Clear color for medium or lighter colors. 2" Diamond Router bit for Grinder. Great for contouring sink holes. Has 5/8"-11 thread like most Angle Grinders. 1-3/8" Diamond Coring bit for Grinder and adapter for Drill. Great for drilling faucet holes. Has 5/8"-11 thread like most Angle Grinders. 4" Diamond Turbo Cup for Grinder. Great for contouring or grinding edges. Has 5/8"-11 thread like most Angle Grinders.